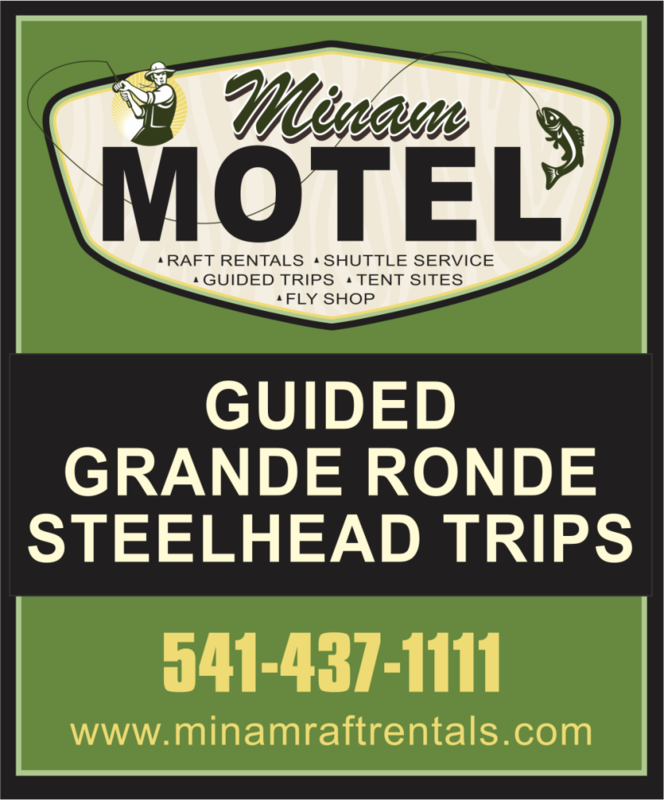 Before Lottie and I bought the raft rental business at Minam I avoided fishing the Grande Ronde. It was a known entity. Or so I thought. 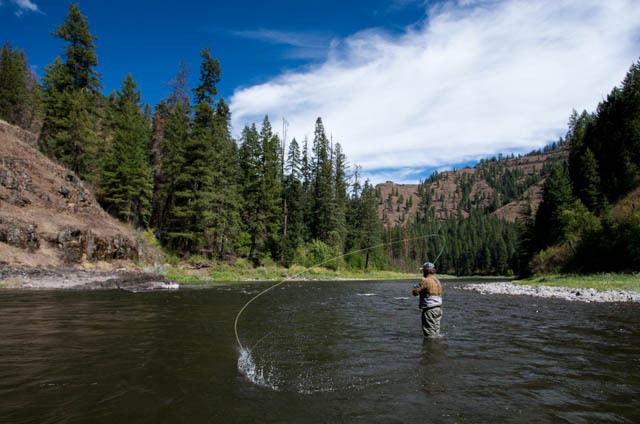 What I thought I knew is that everyone fishes the Grande Ronde elbow to elbow for steelhead along the road between Boggan’s Oasis and Troy or along the road on the lower section near Heller Bar. That is true, but there is a lot more to the Grande Ronde that I didn’t know. What I didn’t know about and had never even heard mentioned was the excellent rainbow fishery that lies in the roadless canyon between Minam and Powwatka Bridge (seven miles upstream from Troy). I will admit that I began dabbling in the Grande Ronde for steelhead before the rafting business. Once I figured out there were roadless sections I could at least partially reach by hiking, well . . . I began hiking in. I was in search of steelhead but was surprised more than once by an overly large and aggressive resident rainbow. To be honest, most places in eastern Oregon don’t harbor big, fat rainbows that can bend a 7 weight rod in half, but the Grande Ronde does. 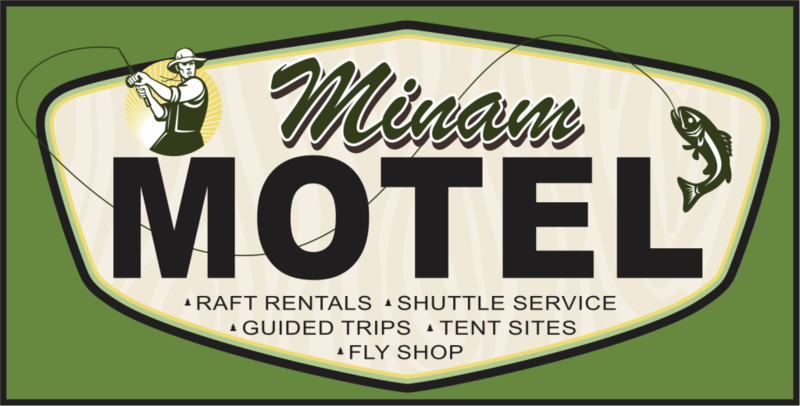 After buying the rafting business, starting a guide service, buying the Minam Motel, and moving to Minam, well . . . 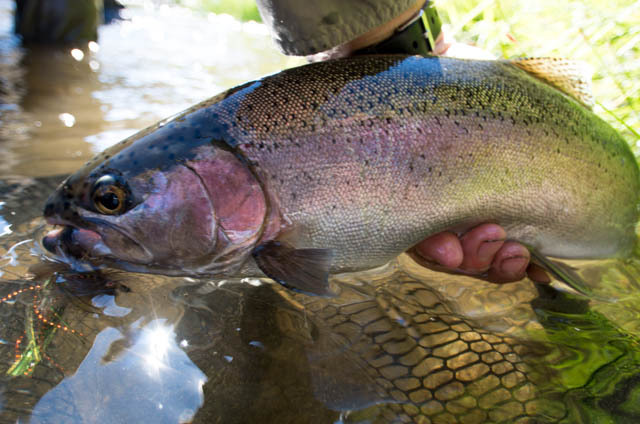 I am still impressed with the qualities of the rainbow fishery here and the beauty of the canyon they are in. It is my perfect world: a beautiful roadless place with big beautiful fish. I have floated the Grande Ronde more times than I can count over the past several years and I am still struck with awe at how big and strong rainbows get in this beautiful canyon. But I was supposed to be giving you a trip report wasn’t I.
Cody Shreve, an excellent fisherman and fly tier I met on the Imnaha several years ago, came up and floated the Wallowa and Grande Ronde with me the other day. We had some torrential rains somewhere up stream on the Minam River and the river jumped up into the 700-800 cfs range. The Minam flows exceptionally clear most times of the year, but it was chocolate brown two mornings before we began. By the morning of our launch the river had cleared up to a slightly off color condition. Dry fly fishing on the Wallowa and Grande Ronde can be very productive at times of the year and at certain times of the day but late August and early September can be a bit slow on the dry fly front during the day. On our 3 day float, dry fly action was extremely slow and fishing a streamer and nymph combination was the most productive. I was all out of double bunnies and strip leeches that I had tied so I decided it was a good time to test the different streamer patterns I am selling here at Minam. I have to say I chose them well because all of them caught fish but my favorites for the weekend were Dali Lama’s and mini-loop sculpins. For nymphs I caught fish consistently with a black Pat’s Rubber Legs until I was out of them, than I caught fish with Barr’s Tungstone, a wired stonefly, and a couple other “store bought” patterns I pulled from the fly bins in our little riverside store here at Minam. The fishing was never exceptionally hot, but not bad either. I hooked into multiple rainbows that pulled and fought hard enough that I thought I had a steelhead on only to find once getting them to shore that they were fat, feisty resident rainbows pushing the 20” mark. 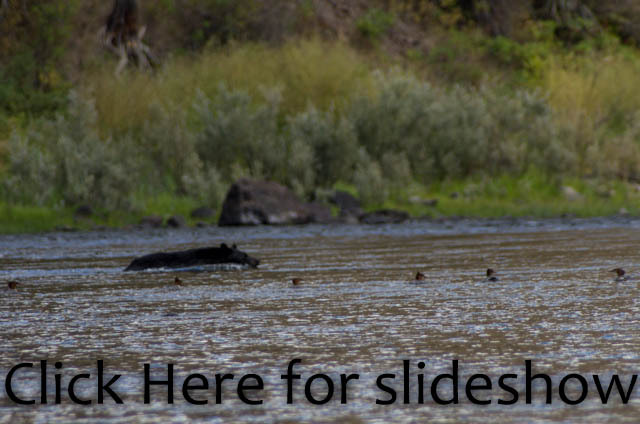 Besides big fish and great scenery did I mention the Grande Ronde has excellent wildlife viewing? I missed “The Shot” of a mountain goat that was standing majestically on a chunk of basalt with his white coat glimmering in the sun all because I hadn’t bothered to take my long lens out of the drybox and mount it on the camera post I built onto my raft frame. Instead I got a so-so shot of him in the shadows. As usual there were numerous bald eagle sightings, mergansers all along the river, a couple river otters, several mink swimming the river alongside the raft, a brownish colored pair of ducks I am not familiar with, what I was pretty sure was a Golden Eagle sitting coolly on the branch of a ponderosa pine, and did I mention we saw not only one but two black bears swim the river in front of us? Check out the picture slideshow for yourself. I often take a paint strainer and collect some bugs to inspect, but this time I remembered to bring along a white container to put them in so I could get good pictures for all you fly fishermen and women out there wanting a better look at the bugs we try to imitate. The shortwing stonefly hatch is pretty well over. This is a hatch I knew a little bit about, but I was mostly ignorant of. I will be doing a full blog post on the shortwing stonefly hatch soon. It is one of those hatches most fly fisherman don’t even know about but it could pay dividends to understand. October Caddis began hatching and numerous shucks were seen on the riverside rocks and the big orange bellied bugs were seen flittering around the trees each night at camp. If you like tossing big dry flies for trout, now is about the time for you to get out there and enjoy the fall caddis hatch. As usual, click the picture below to see a slideshow of the weekend’s trip. Give me a call or shoot me an email if you want to get in a guided trip or a supported trip. Please check out the guided trips page of our raft rental website for more information. Looks like a canyon or two needs to be explored more fully. And I ask the owner to send me a hi Res shot of the Golden eagle in the pine. That shot wants to be an oil painting almost as much as I need a month on the river. Thank you for the show…awesome Bows and hatch shots. Thanks Chris. I can certainly send you a high res image of the golden eagle. You want me to send it to the email address you posted with? That would be awesome Grant! send you a few pics of my paintings. Hey Grant, thanks for your continued reports about a real special place. Will be calling you/Lottie for a shuttle in about 3 weeks. In my past trips, I may have been tempting fate, but did not hang my food…are you hanging, or just rolling the dice? PS. last year, we saw the goats to, I was a little surprised. I have never hung my food unless I was hiking and going to leave food at my camp for the day while I was gone. I usually put food back into the cooler, drybox, or drybag for the night when I am on the river. We have never had a problem with bears coming into camp and getting into stuff. Typically they run away as soon as they see or smell humans. There are at least 9 goats, because that is how many I spotted over the last 3 days in separate parts of the canyon. It would be interesting to talk to the fish and wildlife people and see how many are in there total.